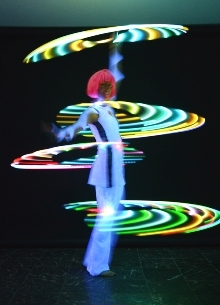 A stunningly beautiful glowing display of circus skill and dance, this act is perfect for indoor functions. Our mesmerizing UV/Glow performance lights up the stage in an explosion of colored lights and movement. with state of the art illuminated equipment, combined with choreographed dance, all set to an original soundtrack. The UV / Glow act can be performed solo, duet or trio. Or Book a UV / glow performance for your event!